As in the game of chess, I am pinned. I cannot move without damage to my existing circumstance. A mild chill is slowly overtaking me. I have been standing here for quite a while now. The sun’s warming rays cannot reach me here and the air is wet and dingy. The dog is laying on the damp ground behind me, with the calm patience of a monk. His thick winter coat of black and white is doing its job well. I want to leave here without scaring these Tundra Swans and return at another time, perhaps even tomorrow. I must find another natural blind to get some photographs or maybe even build a new blind. I crouch down quietly and work my way out of the marsh and into the forest. I have no map of this area and its small secluded nature could only be described on a large scaled map. I will have to climb higher up the side of this mountain to glass the marsh. In this way, I can mentally map the area and look for natural blinds. If I cannot find one, I will have to build one. This majestic bird has captured my interest and I want to record its presence here as it builds a nest and rears its young. 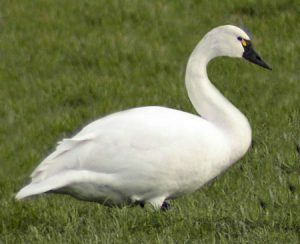 A large, all white bird with black bill, it has a small yellow spot in front of its eye. It is the largest swan in the West. It is called the Tundra Swan or the “whistling swan”. Banding studies have revealed that these swans have been breeding on both the Atlantic Coast and the Pacific Coast of North America. One bird, banded on the Atlantic Coast the previous winter, was sighted in the Central Valley of California, the following year, in March. The more elevation I gain, the easier it is to see the marsh. I see a small island on the south side and I’m quite certain that they will build their nests there. I work my way around the marsh, camouflaged by the forest. As I approach the island, I see that they have chosen their nesting site well. There are no natural hiding spots for me or other forms of predators. The marsh is very wet on this side and I cannot crawl or hide in this environment. Perhaps I can camouflage my kayak and use it as a blind. Major planning and logistics, but it could provide great results. Nothing ventured, nothing gained. I laugh a small laugh inside, thinking of Homer Simpson’s logic … can’t someone else do it! I glass the birds for a long time, studying their behavior. They are unaware of our presence and this time we leave the marsh for another day. We begin the long climb up the mountain for the river valley on the other side. There is a small creek that connects to the big river down there and the fishing is always good. I hurry my pace and the dog takes the lead. He knows when to lead and when to follow. What a great companion to have on these adventures. Never complains, never tires of my crazy ideas and is always full of enthusiasm. This long, gradual climb has me sweating profusely and I can’t wait to reach the meadow and the warm sunshine. As we near the meadow I signal my dog to follow behind me. At the edge, I glass the meadow methodically. I cannot be too careful. There are often big Mule Deer bucks enjoying the warm sun as they chew their cud. I see nothing, except a female Northern Harrier in the far distance. Good time for a break. Sheltered and out of view at the forest edge, I pull out my stove and begin to boil water. Hot chocolate, rye bread with peanut butter and a banana are on this menu. I pull out a bone from the dog’s saddle bag and he grabs it securely in his teeth. He lies down softly and begins to work on the bone. My water is boiling and I turn off the stove. In a Nalgene container, I have a blend of cocoa powder, brown sugar, cinnamon, cayenne, and powdered milk. This makes a very pleasant drink. With the sun shining down on us, I look forward to this meal. The Japanese have a name for this … ICHIGYO-ZAMMAI. In their culture it means … full concentration on a single act! There is so much here to take in. I focus solely on the sunshine. Its warm rays dancing on my bare torso. If you have any comments, questions, or suggestions about my wilderness activities in search of that elusive perfect photograph, please do not hesitate to leave them in the space below. Very exciting and interesting article, you are an adventurous outdoors man without a doubt. Great you have your doggy companion to keep you company, I would be interested in hearing more about this stove you mentioned in your article? What does this stove heat on for fuel, where do you find this type of stove and how durable are they during cold winters like you experience it sounds all the time? Good Day Jeffrey, and thanks for stopping by to visit. I have 2 main stoves that I use for backpacking and day hikes. With the warmer Spring weather here now, I am using my SnowPeak. The Best Backcountry Compact Stove. This stove weighs only 90 grams and a 110 gram canister of Iso-propane will burn for 45 minutes. This stove has a 10,000 BTU output. It will perform to -10 C.
Another stove that I use for longer trips in colder temperatures is the Whisperlite. The MSR Whisperlite Liquid-Fuel Stove. This is a multi-fuel stove that I would bring on longer, and more intensive expeditions. I have had these 2 stoves for many years and they never let me down. My cabin stove is metal wood stove and weighs in the 30 pound range, chimney included. The top 2 models can be purchased at Amazon and many other sports outlets depending on your country of origin. Fuels will NOT be shipped by mail in most cases. This brings the Wisperlite International into better focus. It will burn gasoline, diesel, kerosene, and other liquids. Have a look at these 2 models and if you have and further concerns, please do not hesitate to return here for answers. Really great read man! This is one of the few articles I have read lately that really grasped my attention; mainly because of the high level of description. Thanks for the read Rhett. I am very happy to hear that you bring your dog along as well. They make great companions and are always filled with enthusiasm. Drop by again and tell me more about your adventures.